My Jell-O Egg in Half -- NOT very appealing! 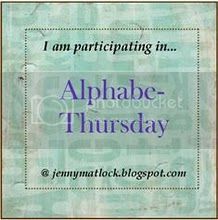 I am submitting this post to Jenny Matlock's Alphabe-Thursday where the letter of the week is "J." You can find other "J" posts by placing your cursor on the link below and clicking on the displayed link. When we were young, my mother would make dyed Easter eggs by putting two holes in an egg, one in the top and a larger hole in the bottom. You would blow in the top hole and, hopefully, the white and the yolk would come out in the bottom. Then you would dye the eggs. At least one Easter, after blowing out the yolk and white, my mother poured Jell-O in the eggs and refrigerated them. After the Jell-O became solid, she peeled off the shell and voila....Jell-O eggs! So on Easter Sunday she brought out the Jell-O eggs and instead of eating them, the kids played catch outside with the Jell-O eggs! Or did we just throw them at each other? 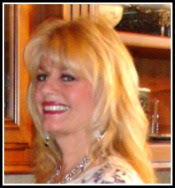 Okay, here is the kind of funny part with a caveat...I AM getting older and maybe my memory is not quite right! That next fall when we were raking leaves in the same area where we had thrown the eggs, we found some of the Jell-O from the eggs still in tact! Mind you, I lived in Wisconsin with hot, humid, wet summers! Okay, so could this really be possible or am I losing it? What do you think? I asked my scientist-type husband if he thought it could be possible and his very scientific answer was "maybe!" A few years ago the Jell-O company made a contraption for Jell-O eggs. As you can see from the picture above, I haven't had a lot of success with it; the contraption tends to break the eggs in half when you open it! Forget the Jell-O, I am sticking with chocolate eggs! I think your mother was pretty clever with those Jello eggs. Wouldn't something have come along and eaten the Jello? Of course, maybe it melted and then when the weather become cold it jelled again. You think??? I have made those myself!!! We hve found eggs that we hide MONTHS after Easter in our yard! Thanks for your prayers, I appreciate it. Wow, too bad your mother didn't think of making a form. You could have been rich LOL. How cute a story! But Ok if the jello is still in the same shape all that time, what does it do to our digestive system? Thanks for stopping by, and yes those eggs looked difficult! I used to do a devotional for Childrens Church and used a jello egg! I had forgotten all about that. Thanks for refreshing my memory. That is so funny. Jello is an interesting creation. I'm with you chocolate eggs all the way. I had to laugh, because I had one of those jello egg forms and never got it to work! Thanks for the memory! I've heard of blowing out the egg insides before,but never putting jello in. I can't tell you the blast my boys would have with those jello eggs. 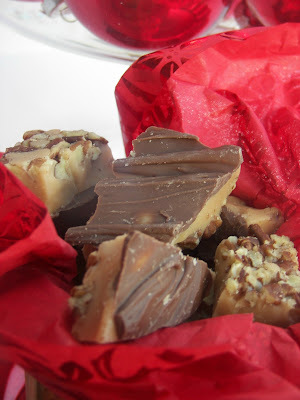 But I'm with you.. chocolate (preferably malted or with peanut butter) all the way. What an interesting and unusual post. I ate a lot of Jello as a kid....now you have me wondering if there isn't some still undigested inside my body. This was a funny post. I have seen recipes for jello eggs. It sounds like they could last forever. Yes, we've made Jello eggs. I have no clue as to how long they would stay intact, but it does sound reasonable. I am sure that your memory is not that bad!! Thanks for sharing that "J"ello story with us today! Have a great day. What the heck did you put in those Jello eggs?! I'm glad you didn't eat them. I have never had luck with those jello molds either. On TV it looks so easy and pretty. But then most things do! 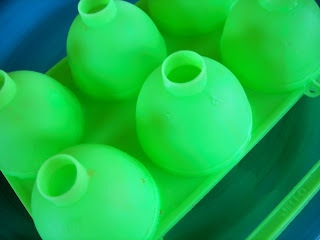 Jello eggs... very clever J post ;) ! i love the idea of jello eggs...i was thinking of trying to be very martha this year and fill blown out eggs with chocolate..but maybe jello would be better received...how fun! Thanks for stopping by HFTS. How wonderful that you have kept a journal all these years. I'm impressed! By the time you add your family photos your family history is going to be a priceless treasure. I can only imagine how much time and effort has gone into this project. Good for you! It actually made some unnamed part of my body jiggle with laughter. But, that's enough information about that I think! I haven't heard of Jello eggs, or making them. Sounds so interesting, but difficult task to do. Jello is such a weird but delicious thing. A couple of years ago for Halloween I got a brain mold and made a green jello brain, which was a big hit. My sister-in-law used to make jello eggs for all the kids at Easter. My son and daughter looked forward to those every year! ewww, months later?? Makes ya just wanna eat some jello now doesn't it?? What a great memory your mom made for you! OMG...just think what is hanging around inside us? Do you know how much Jello I ate as a kid???? YIKES! Wow, all this from the letter "J"?! That's a really funny story, true or not! okay, that all just sounds wrong ... i am seriously wondering what a life time of jello eating has done to me ... eeeks, its now scary just to think about it!!! I've never had any luck with an jello mold. Ever. My mother-in-law, and the other hand makes perfect jello molds every time. Totally loved your j post. 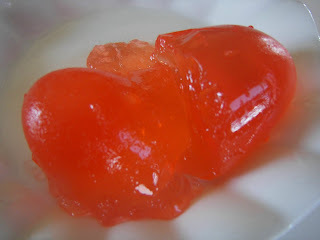 Love jello eggs but am a bit disturbed that they may outlast summer! Thanks for coming to visit my blog!